Lessons I learned after playing thousands of chess games have turned into principles I now use in life. I discovered the game of chess back when I was in middle school. As I played my very first match, I knew I would fall in love with this game. It just resonated with me deeply on a personal level. I always loved problem solving and critical thinking – skills that were essential for chess. I always preferred games that involved intellect, strategy and heavy utilization of the mind, over physical sports like football. The latter just didn’t interest me. In my games, I remember sacrificing crucial pieces, in order to checkmate my opponents. I became so skilled at sacrifices, that I could easily sacrifice valuable pieces like the Bishop or Rook, in order to get a better position, and checkmate my opponent in the long run. Many years later, I realize this same principle applies to life as well. In fact, this principle is absolutely crucial if you want to achieve a big dream in your life. In order to achieve something big, you have to sacrifice along the way. Sacrifice can be in terms of taking risks, or giving up luxuries and pleasure so you can work harder for your goals. The people who achieve the most in life are the ones who are able to sacrifice in the short-term to win big in the long-term. In chess, some pieces have a higher value than others. The value of a queen is way more than a pawn. What a queen can do to help you win the game is something a pawn can simply never do. Similarly, a pawn can never have the same worth as that of a Rook. 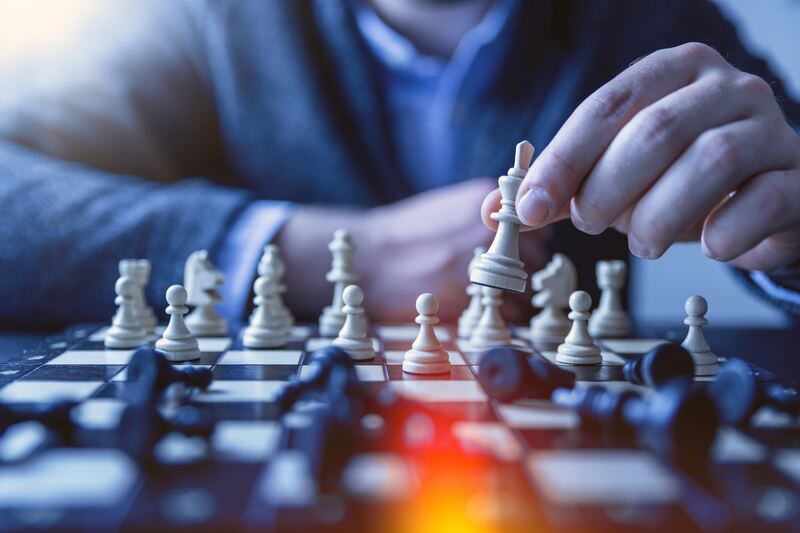 In order to win at chess, it’s essential to realize the value of your pieces, and leverage them in the most effective way possible, while keeping the long-term plan in mind. If you don’t value your queen, and expect some pawn to help you win the game, you will lose. If you don’t protect your queen or rook, you risk losing them and getting checkmated. I find this principle replicable in the world of business as well. Initially, when I started playing the game of business, I struggled with hiring and finding the right team. I preferred hiring people with less value, and this led to significant losses for me. After many failures, I now understand the importance of realizing who your best players are, and utilizing their skills in the most effective way possible to help you win at business. It’s always worth it to spend more money to hire people who are more skilled. And it’s essential to value your most important employees, because if they are happy, they will do their best to help you win. During a game of chess, we often make mistakes. If you are able to spot your mistake in time, and act quickly to fix it, you can still hope to win the game. However, if you start to believe that you can no longer win the game, majority of the times, you will lose, even if a possibility of winning had existed. In life as well, we often encounter failures and temporary defeats. It’s important to quickly realize your mistakes, understand what you did wrong, and continue believing and working towards your dream. If you learn from your mistakes, and continue believing, eventually you will win the game. I didn’t play chess because I had to, or someone was forcing me to play it. I played because it was fun. It was thrilling. I loved the thought process that went into every move I made. I loved the look on my opponents face as I used well-thought-out strategies to trap them into an inevitable checkmate. I loved the game itself as much as I loved the final victory. The same principle should apply to whatever you do in life. Having fun, being curious, and always trying to learn and improve should be the cornerstone of every endeavour. Too many people are stuck doing jobs they hate. Too many people are spending their life doing things they don’t like. That’s a really sad way to live life. Life is too short to do things that you don’t enjoy. The end goal should always be to be happy, and have fun. If you’re doing something that is not bringing you happiness, or if it’s something that you don’t enjoy, then don’t do it. After years of playing chess, I realized that we can learn to treat life itself as a giant chess board. We’re the ones in control of this game. We move the pieces. We can attack when we want. We can sacrifice what we want. We can strategise, and set long-term goals. In the end, there is a dream to be realized, hurdles to be overcome, and sacrifices that need to be made along the way. I made my decision a long time ago, and I don’t intend to turn back. I love the process as much as I love the final checkmate, so I’ll just keep playing this game till the very end. Nabeel Ahmad is the founder and CEO of Vertabyte, a full-service digital media agency that partners with clients to drive their growth and achieve all their business goals. At Vertabyte, his special focus is on leveraging the power of social media to boost businesses exponentially. A marketing expert, Nabeel has a deep understanding of what it takes for a business to completely crush it on the social media landscape. His expertise in marketing has allowed him to help a number of businesses increase their revenue by tremendous amounts.